The Stenquist Test of Mechanical Aptitude is a slight variation from the standard mechanical tests such as Bennett and Wiesen. In the Stenquist version of a mechanical aptitude test, the individual is required to observe a set of pictures and determine which picture best fits in with another group of pictures. This is a different way of measuring mechanical aptitude, but it still gets at the same point as the other tests. Those with a strong inherent knowledge of machines and tools will succeed on this test without much (if any) formal training or educational background. Since the test relies on pictures to evaluate the individual, any reading or comprehension issues that could create a problem on other tests will not be a factor when taking the Stenquist version. As with any other mechanical aptitude test, the Stenquist test can be used to predict the performance of an individual in a specific career field. In fact, this test can be found in a variety of different versions based on what kind of field the test taker is pursuing a career within. 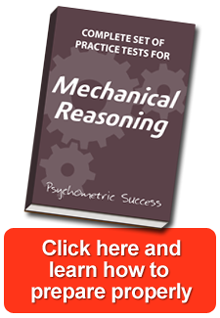 If you are working on getting into any kind of mechanical career field, you might find yourself needing to take the Stenquist Test of Mechanical Aptitude as part of your screening and application process. Many different jobs could ask you to take this test, including trades such as electrician or plumber, police and firefighter, military positions, carpentry, and more. The good news as it relates to the Stenquist test is that you will not need any specific experience to do well on the test. If you are able to grasp the basic concepts involved with the field of mechanics, you can succeed on the Stenquist test. Mechanical reasoning is something that comes naturally to some people, while others have to work at it to gain a good understanding. No matter if you are naturally gifted in mechanical thinking or not, proper study and practice can lead you to a great score on this test and hopefully a career in the field you are pursuing. When you learn that the Stenquist test is based around comparing groups of pictures, you might think that you do not need to study or prepare for the test to do well. Although there is a ‘common sense’ component to a test like this, solid preparation is still the key to success. You don’t want to be caught off guard when you sit down to take the test and waste valuable time getting yourself comfortable with the format of the exam. Even experienced mechanical aptitude test takers who are seeing the Stenquist version for the first time should make sure and work through some sample questions to polish up before taking the test for real. You will be nervous when taking the test if you are doing so as part of a job application and interview, so knowing what to expect will help calm those nerves. After a short period of study, you will become comfortable with how the pictures relate to each other and what you should be looking for when test day comes. The Stenquist Test of Mechanical Aptitude is one of the oldest mechanical reasoning tests still in use today. Dating back more than 100 years, the principles of this test have not changed much in that century of time. The test is still in use because it does a good job of finding individuals that think mechanically and can problem solve on the go. Rather than dreading the test as part of the hiring process, embrace it and strive to achieve a great score. Coming in high on the Stenquist test should quickly improve your job prospects and will have you on the fast track towards the career you desire.